Our racks are the most common used in the wine industry. 7 inch, double bar, two barrel racks. Used racks will have some exterior rust, but the interior of the steel bars is not compromised. We know this from a study we performed some years ago where we took around two dozen of the worst rusty racks as well as those with dents and dings and cut them open to inspect the interior. We found the interior of the steel bars to be pristine, rust free and not compromised except for those that had cracks open to the interior of the steel bars. 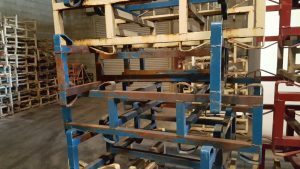 Racks with exterior rust and even paint chipping off remain serviceable unless the interior is compromised by cracks or severe dents or the rust is so severe that the steel bar wall thickness is significantly diminished. 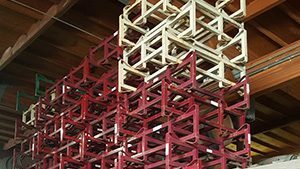 We do not sell racks that have significant cracks or dents or where the exterior rust might compromise the steel bar wall thickness. Of the tens of thousands of racks we have sold we have never heard of a rack failure or structural issue. 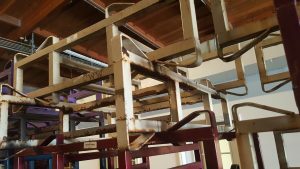 Our pricing reflects the fact that these are racks that have been inspected to ensure they will perform well in your cellar, but are used and show their age with some rust and minor dings and scratches. Please email us for current inventory and pricing.